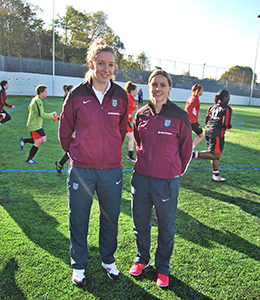 Two England women's football stars visit Middlesex University for a training session and media event. Ahead of the forthcoming England v Germany game at Wembley, England's all-time leading goal-scorer Kelly Smith and goalkeeper Siobhan Chamberlain took part in a live media event co-ordinated and covered by Middlesex University's students. The two Lionesses had a training session with the Middlesex University women's football team before answering questions from BBC London and Middlesex's media students. Television and journalism students were given the opportunity to interview the two England stars, while PR students took part in the organising of the event. The captain of Middlesex's team, Iselin Vestnes, found the experience enriching both for herself and her team, "To have Kelly Smith come and take a session is a fantastic opportunity for anyone," she said. 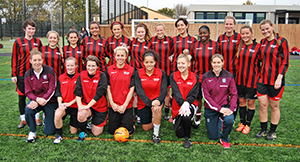 The Middlesex University women's team which includes a current representative of Women's Super League 2 outfit Watford Ladies FC and a Portugal U-19 international and has been boosted by increased participation. England's Siobhan Chamberlain said: "I recommend students take every opportunity, listen to any advice and always be confident but take any kind of criticism you are given in a positive way and always look to improve." The event was to promote the England vs Germany women's international football match and the growth of the women's game. The clash, taking place on Sunday 23 November, will have the biggest crowd for an England Women's international with nearly 45,000 tickets sold. Siobhan Chamberlain is the England goalkeeper and has represented the national football team on 25 occasions since her debut in 2004. Kelly Smith is England's record goal scorer with 46 goals. She has 100 England caps and also played for Great Britain at the 2012 Olympics.